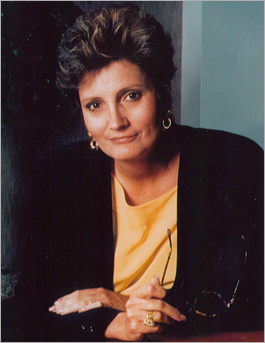 Nancy Woodhull (1945-1997) is well remembered for breaking new ground for women and minorities as a founding editor of USA Today and a leading proponent of quality journalism in her career. Her pursuit of equality for women was not restricted to the newspaper industry. She also urged women to take their own actions to improve their situations in society when she worked with Friedan, an early advocate for equal rights for women. Woodhull also advised women not to give up a family life in order to be successful in a business career. Out of her steadfast commitment to supporting women, Woodhull took on numerous leadership positions including vice chair of the IWMF, co-founder of Women, Men and Media and president of the National Women’s Hall of Fame. She began her career at The News Tribune in Woodbridge, New Jersey, and in 1973 joined the Detroit Free Press as a reporter. She held a variety of editorial positions for Gannett’s Rochester newspaper in the 1970s. She was the first Managing Editor/News at USA Today when it debuted in 1982. She was also a former president of Gannett News Service and of Gannett New Media, which belonged to Gannett Company, Inc.- USA Today’s publisher. After leaving Gannett Co. Inc., she was executive vice president and editor-in-chief of Southern Progress Corp., a Time-Warner subsidiary. Woodhull was a trustee of The Freedom Forum from 1990 to February 1996. She was senior vice president of The Freedom Forum and executive director of The Freedom Forum Media Studies Center. After a four-month battle with cancer, she died April 1, 1997 at her home in Pittsford, N.Y.
Nancy Woodhull is the sixth IWMF Lifetime Achievement Award winner from the United States, following Meg Greenfield (1996), Helen Thomas (1995), Katharine Graham (1994), Nan Robertson (1993) and Barbara Walters (1992). Awardees after Woodhull include: Bonnie Angelo (1998), Peggy Peterman (1999), Flora Lewis (2000), Colleen “Koky” Dishon (2001), Mary McGrory(2002), Belva Davis (2004), Molly Ivins (2005) and Edith Lederer (2008).